President Donald Trump is defending his plan to raise taxes on steel and aluminum imports entering the United States. Trump declared on Friday that “trade wars are good, and easy to win” -- a claim that some Americans were quick to criticize. The critics include members of his own Republican Party. Trump has said that the U.S. government would set punishing tariffs on steel and aluminum imports. Such a move would increase tensions with China and other countries. They also would raise the possibility of higher prices for American businesses and consumers. His announcement came only after an intense debate among his top aides. It brought strong criticism from some Republicans and financial markets concerned about tariffs and their effect on the economy. The Associated Press says it was not immediately clear if the taxes would affect all trading partners. Around the world, Trump’s words led to criticism from the president of the European Commission, Jean-Claude Juncker. He rejected the plan as a clear intervention to protect U.S. domestic industry. Juncker said the EU would take steps to punish the U.S. if Trump followed through. China’s Commerce Ministry said it was seriously concerned about Trump’s plan. The ministry said China has satisfied its trade agreements and appealed to the U.S. government to settle disputes through negotiation. China has received many complaints from the United States, Europe and other trading partners. They accuse the Chinese government of unfairly supporting Chinese exports and restricting the Chinese market in violation of its free-trade promises. Canada is the largest provider of steel and aluminum imports in the U.S. The Canadian government said it would “take responsive measures” to defend the country’s trade interests and workers if the tariffs affected Canadian steel and aluminum products. 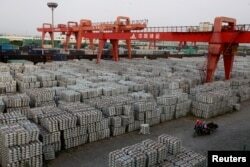 FILE - Workers ride through an aluminum ingots depot in Wuxi, Jiangsu province, China, Sept. 26, 2012. On Friday, China warned of a "huge impact" on trade if the U.S. places tariffs on steel and aluminum. Critics warned Trump’s tariffs may lead to a trade war. They suggested other countries will take action to punish the United States or use national security as a reason to set their own trade rules. Trump’s move will possibly raise steel and aluminum prices in the U.S. That is good news for American companies, but bad for companies that use the metals, such as manufacturers of beer and air conditioning equipment. The American International Automobile Dealers Association said the tariffs could cause the cost of a car to rise a lot. Wendy Cutler, a former U.S. trade official, noted “What benefits one industry can hurt another. What saves one job can jeopardize another.” Cutler is now vice president of the Asia Society Policy Institute. American companies said steel tariffs announced in 2002 by then President George W. Bush destroyed 200,000 U.S. jobs. The new tariffs were requested by Commerce Secretary Wilbur Ross and White House trade adviser Peter Navarro. White House press secretary Sarah Huckabee Sanders said the decision “shouldn’t come as a surprise to anyone,” saying that the president had been talking about it for many years. Trump has long accused China and others of what he calls unfair trade. 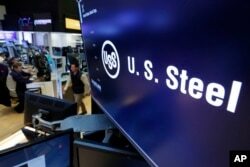 FILE - The logo for U.S. Steel appears on a screen above the trading floor of the New York Stock Exchange. But some Republicans in Congress were angry. Senator Ben Sasse of Nebraska said the tariffs were a “tax increase on American families.” Sasse noted that he would expect Democratic Party lawmakers to set trade tariffs, not Republicans. House Speaker Paul Ryan, a Republican from Wisconsin, said through a spokesman he hoped Trump would consider the effects of a trade war. Ken Thomas and Paul Wiseman reported this story for the Associated Press. Susan Shand adapted the story for Learning English. George Grow was the editor.